When we set our compass "due north" to empathy, we humanize our work in schools. Schools, not unlike hospital emergency rooms, are incessantly busy places. Those in charge must make complex decisions at wearying speed, knowing that those decisions bear strongly on the welfare of others, and yet finding sparse opportunity to reflect on their actions in the press of the day. The question of what internal or external compass guides educators' decision making is complex as well, and in many instances, there is no evident answer. School leaders seek to do well for the adults whose work they guide. Teachers seek to do well for the young people they teach. And yet, there are few sustained conversations in many schools about a compass we agree to use that points us to "due north"—to the direction most likely to lead us to a good place. We make decisions about curriculum too often based on documents that an external authority hands to us. We make instructional decisions to ensure that we "waste" no time in covering curriculum, so that our success and that of our students will be judged affirmatively on standardized measurements that many teachers themselves believe are oppressive and even unjust. We find ourselves making disciplinary moves based on a uniform point system, when our students are decidedly not uniform. We adopt new initiatives with no deep understanding of their implications because, on the surface, they seem fresh or may alleviate the urgent pressures that bear on all of us associated with schools. It's easy to interact with parents from a position of exhaustion and even defensiveness. And in all these instances, we always mean to do better. Still, the job gets done. Good things happen in schools on a regular basis. And we move on. We must acknowledge, however, that these kinds of decisions are not pathways to lasting improvement. So, here's a question worthy of our consideration: What if our compass—our "due north" for decision making—was creating an "empathetic school"? What if we set our sights on creating an environment where our central and shared goal, as we teach and lead, is to understand the experiences and perspectives of those who share our space and to make decisions based on what would serve them best? What promise might accrue in a school where leaders, faculty, and staff aspire to practice empathy and to support students in doing that as well? There's reason to conclude that such an approach would result in a school that extends the potential of both the adults who work there and the students who attend—energizing a community in far-reaching ways. At its core, the term empathy suggests an ability to understand and share another person's feelings and emotions—to see things from the perspective of another and understand another's point of view. Bob and Megan Tschannen-Moran (2010) describe empathy as a "respectful, no-fault understanding and appreciation of someone's experience; as such, it is an orientation and practice that fosters radically new change possibilities" (p. 21). Language is tricky, however, and subtle distinctions can be important. Some experts worry that empathy can lead people to feel so deeply with others that they themselves literally share the fear, pain, anxiety, or self-doubt of the person or group with whom they are empathetic. As a result, empathy can become exhausting and disabling rather than energizing. These experts (such as Bloom & Davidson, 2015) prefer compassion to empathy. Although there is overlap in the terms, there is an important distinction. Compassion suggests we understand and care about what another person feels, but do not attempt to feel it ourselves. In that way, compassion, these experts say, is more likely to lead to action on behalf of another because it calls on us to be kind and to see the need for action rather than simply to experience the feelings of another. On the other hand, the term compassion may be more deeply associated with the suffering of another person, while the term empathy may suggest being attuned to positive feelings as well. It seems wise to seek to recognize and act on feelings like joy, satisfaction, success, and engagement, as well as feelings like distress, fear, isolation, anger, loneliness, and hopelessness. With these semantics in mind, we offer the idea of an "empathetic school." We choose to define empathy as seeking to both understand a person's condition from their perspective and understand the needs of others, with the aim of acting to make a difference in responding to those needs or building on the positives. If you prefer the idea of a "compassionate school," that phrase works, too. In either case, the goal is to humanize the work we do by understanding and learning from one another in ways that lift our work. Grounding our work in empathy (or compassion) is a theme in numerous, enduring bodies of work in education, psychology, and neuroscience. Maslow's hierarchy of human needs (1943) indicates that learning follows satisfaction of more fundamental needs, such as those related to physiology, safety and security, belonging, and love—suggesting that teachers' attention to the status of those needs in students is central in grasping a young person's readiness to learn. In addition, self-actualization, the pinnacle of Maslow's hierarchy, implies a sense of purpose, morality, and fulfillment to which a person's work should certainly contribute. Similarly, key theories of moral development (such as Gilligan, 1982; Kohlberg, 1969) suggest a progression from focus on self and personal preference through a series of stages that increasingly value relationships and the perspectives of others, and ultimately employ universal and comprehensive principles of morality, such as mutual respect, justice, and kindness, as guiding principles for one's life. Stress and negative classroom associations impair learning. Emotion surpasses cognition, so that when a learner feels threatened, it is unlikely that the part of the brain in which cognition occurs will function as it should. The brain is quick to tune in to threat and slow to forget it (see the work of Sousa, 2011; Sousa & Tomlinson, 2017; Willis, 2007). The brain is a social organ and so close, supportive relationships enhance learning (Cozolino, 2013). A teacher functions much like a parent in building a young person's brain. A caring teacher who shows positive regard for a learner, demonstrates optimism, is encouraging, and minimizes classroom conflict positively impacts student achievement (Cozolino, 2013). In addition, Carol Dweck's work (2006) makes a compelling case for the importance of teachers working from a growth mindset about their students so those students can develop a growth mindset about themselves and others. Findings from all these disciplines call on a teacher to understand students' classroom experiences and to orchestrate positive classroom experiences—to see school through the students' eyes and to respond in ways that minimize negative experiences and maximize positive ones. It is not a great leap to translate the conclusions to adults in the school as well, so that decision making seeks to foster positive working conditions for and build supportive relationships among adults in the building as well as students. Paul Zak's recent work (2017) suggests that a more intentional investment in people and their growth encourages "whole people development." This investment has the potential to lead to "a culture of trust and purpose, [which] resonates with the social nature of human beings and creates engagement, joy, and profits" (p. 208). Therefore, an empathetic school would place the highest value on not only caring about those who spend much of their lives in schools, but also caring for them. In other words, making decisions that go beyond an interest in students and teachers to doing whatever is necessary to promote their growth and welfare (Gay, 2010). An empathetic school asks everyone in it—teachers, leaders, staff, and students—to diminish some of their self-focus and respond in a fuller and more informed way to those around them. It guides us to develop an inclusive place where the highest aspirations of democracy are consistently at work, where community functions as it should, and where the best of human behavior is evident every day. It asks us to invest both our cognitive and affective energies toward those ends. With that focus, we would seek to know those around us beyond the surface. We would pause often to listen. We would frame teaching and leadership around significant issues and ideas that can infuse lives with meaning and purpose. We would create classrooms, meetings, and informal spaces characterized by dialogue rather than monologue. In those places, we would express gratitude when that is called for, generosity always, and forgiveness when it is needed. Teachers in such places would consistently give students voice in what they learn, how they learn, and how they might best show what they know. They would look for the problem behind misbehavior rather than seeing the child as a problem—and find solutions to the problem rather than punishments. Principals in these contexts would join with teachers to craft spaces and schedules that invite learning, account for human variance, and anticipate the need for flexibility. Teachers and principals alike would focus on assets rather than deficits, helping others identify their strengths and use those strengths as launching pads for further growth. These things are often neither intuitive nor easy to achieve. They are aspirational. Nonetheless, pursuing the aspiration makes us more attuned to one another, to the world around us, and to ourselves. It makes us better people and better educators. In the empathetic school as we envision it, the principal would play a crucial role. The principal would have to work with others to envision and institute a critical vision of mutual support. He or she would do this by seeking to understand and respond more effectively to the needs of all members of the school community and to expand the reach of that community by learning from its diverse perspectives. It is the principal who must develop, observe, and share "purpose narratives"—examples, illustrations, and stories that reinforce the reason for and meaning of the work of empathy (Zak 2017, p. 177). It is also the principal who must guide the school community's recognition of the power of what Fullan (2007) calls a purposeful school—a place where people understand and reach for a moral calling. This provides a reason for their work that extends beyond and strengthens each person in the community and the community itself. The principal would strive to ensure that faculty and staff learn to trust him or her, trust the work they are doing, and trust one another to be allies in that work. To that end, the principal would seek alignment between the way the school functions and what teachers seek to implement in their classrooms. The principal would also aim to be a model of empathy in all its aspects, including in what it means to translate growing understanding and insight into action. Further, the principal must help sustain the energy and productivity of faculty and staff over time, including helping colleagues derive satisfaction and joy from working with others whom they trust and with whom they share a purpose (Zak, 2017). Central to the leadership role of the principal in the empathetic school would be working to clear the way through the incessant external demands so teachers can find time to focus and act on empathy. Leaders must resist pressures to standardize young humans and to measure the effectiveness of students, teachers, and schools with instruments that are too often shallow, restrictive, and draining. Further, the principal would play a key role in seeking out and providing, over the long term, the kind of support teachers must have to understand and develop comfort in working from a point of empathy. In all these arenas, the principal would take care to seek the counsel of colleagues, empower other leaders to contribute to decision making that facilitates empathetic practice, and ensure consistent examination of ways in which emergent practices affect the development and achievement of students, the lives and work of teachers, and the functioning of the school as a whole. There is no paint-by-number approach to developing and practicing empathy as a basis for living, working, and decision making in our varied schools. Still, there are outcomes that we might expect as focus shifts. Among other expectations, it is reasonable to assume that understanding, appreciating, and addressing people's feelings, needs, and perspectives could lead to more opportunities for teachers to share successes and concerns with colleagues and leaders; more collaborative relationships between teachers and parents; greater student voice; fewer incidences of bullying; and a curriculum and instructional style that foster a love for learning. In a high-empathy middle school we visited, students ran a multifaceted anti-bullying initiative, which provided safe spaces where students who were bullied could find support. Students also participated in challenging conversations that examined the dynamics of bullying, specified negative outcomes, and encouraged peers to step up to the challenge of being a positive force in the lives of others. In a high-empathy, high-poverty K–8 school we visited, there were greeters at the entrance to the school every day to speak with each student personally. In that school, older students served as "Way Finders," mentoring younger students in the knowledge, attitudes, and skills necessary for success. The halls were canopied with banners that pointed the way to productive thoughts and actions. Both schools held high expectations for students and faculty alike and provided support for both. The schools offered lively and engaging classes that connected students with the world outside of school and made learning feel like a worthy investment. Human beings are born with the capacity for kindness and compassion; however, that capacity has to be nurtured to be fully realized. People in whom it is nurtured are better equipped to live meaningful and productive lives. Empathy is a link between self and others—a channel for experiencing and expressing kindness and compassion. Working together as teachers, leaders, and students to build an environment that embodies compassion and empathy stretches all of us. It extends our possibilities. It satisfies a profoundly fundamental need. In a recent (2012) essay, Art Costa, Robert Garmston, and Diane Zimmerman reflected on "the deeply flawed belief"—often exhibited in the way we do school—"that teachers and students are interchangeable parts, rather than thoughtful, unique, caring, experienced, and often passionate human beings" (para. 12). The essay counseled that "we should be supporting systems that develop the essence of teachers who inspire a love of learning" in contrast to those whose aim is predominately "to get students to demonstrate mastery on achievement tests." In a democracy, education should be "precisely concerned with equity, access, and recognition of the full humanity of everyone" (Ayres, 2010, p. 152). An empathetic school would focus on the full humanity of each member of the community. 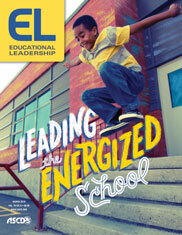 It would be energizing to work there, and it would enable educators to teach, learn, and make choices as acts of caring. It would nurture in students the desire to understand and the capacity to reach out to others with acceptance and trust. In the end, that's much of what a life in school should do for us, individually and collectively. Ayres, W. (2010). To teach: The journey of a teacher (3rd ed.). New York: Columbia University Press. Fullan, M. (2007). Leading in a culture of change (revised edition). San Francisco, CA: Jossey-Bass. Gilligan, C. (1982). In a different voice: Psychological theory and women's development. Cambridge, MA: Harvard University. Kohlberg, L. (1969). Stage and sequence: The cognitive development approach to socialization. In D. A. Goslin (Ed. ), Handbook of socialization theory and research, pp. 347–480. Chicago, IL: Rand McNally. Sousa, D. (2011). How the brain learns (4th ed.). Thousand Oaks, CA: Corwin. Sousa, D., & Tomlinson, C. (2017). Differentiation and the brain: How neuroscience supports a learner-friendly classroom (2nd ed.). Bloomington, IN: Solution Tree. Tschannen-Moran, B., & Tschannen-Moran, M. (2010). Evocative coaching: Transforming schools one conversation at a time. San Francisco, CA: Jossey-Bass. Willis, J. (2007). Brain-friendly strategies for the inclusion classroom. Alexandria, VA: ASCD. Zak, P. (2017). Trust factor: The science of creating high-performance companies. New York: American Management Association. Carol Ann Tomlinson is William Clay Parrish, Jr. Professor and Chair of Educational Leadership, Foundations, and Policy at the University of Virginia's Curry School of Education. Michael Murphy is an educational coach, facilitator, and consultant who is recognized for his leadership training in planning, communication, feedback, long-term change, and motivation strategies. Tomlinson and Murphy are co-authors of Leading for Differentiation: Growing Teachers Who Grow Kids (ASCD, 2015).